I am so thankful that Farley posted this evening. This next week is insane! Listening: Ok...I know... I'm not proud, but... those ladies are crazy! Take your pick with any of the Housewives! Loving: Loved being off Friday! My god children (18, 16 and twins 14) along with their dad, stayed with us this weekend. We had so much fun! My daughter adores the 18 and the 16 year olds. They are the big sisters she doesn't have and they are so dear to my daughter. Our neighbors from up the street came over last night. Chalupas, queso and games. We played Mexican Train and Apples to Apples until about 12! Thinking: I am so proud of all the hard work my students have done this year. The reading and math state tests start on Tuesday. 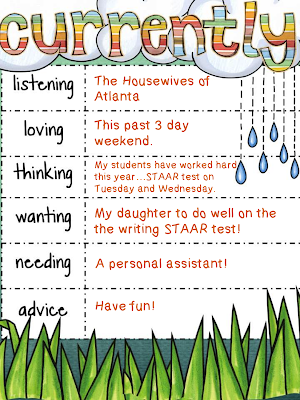 Wanting: My daughter takes the 4th grade writing test on Tuesday and Wednesday. She has had a few tearful moments about wanting to do well on the test. Breaks my heart! We have talked about just doing your best. Advice: Just have fun! Blogging should be fun, creating should be fun! Can't wait to hear what you are up to! Good luck to E and to your class this week! Thanks for following...I one of your newest followers now! I know...I just got the lecture about getting off my computer and getting to bed! Best of luck to your class this week! Here in New York City, we take our tests in 2 weeks for Reading and 3 weeks in math. It's really sad to see how much pressure these kids feel. I hope your daughter does well too--that would break my heart too. Thanks! Best of luck to your class! Not sure where to find the personal assistant! Plus...they gotta work cheap! I got to visit NYC this past summer. Loved it! It was just a day trip, but had so much fun! your daughter will do fine... poor thing!!! I hate that our kiddos have that much stress too!!! horrible!!! I think I am getting hubs a personal trainer... I am going to pick a really cute hunky guy!!! and that way I can watch both of them work out... get my moneys worth right!!!!??? I know she will! Might struggle a bit on the conventions part due to the dyslexia, but she loves to write and that's the part that makes me sad that she is stressed out about not doing well. Nice plan! My trainer isn't a cute hunky guy, but she sure did kick my fanny into gear! Ooooh! 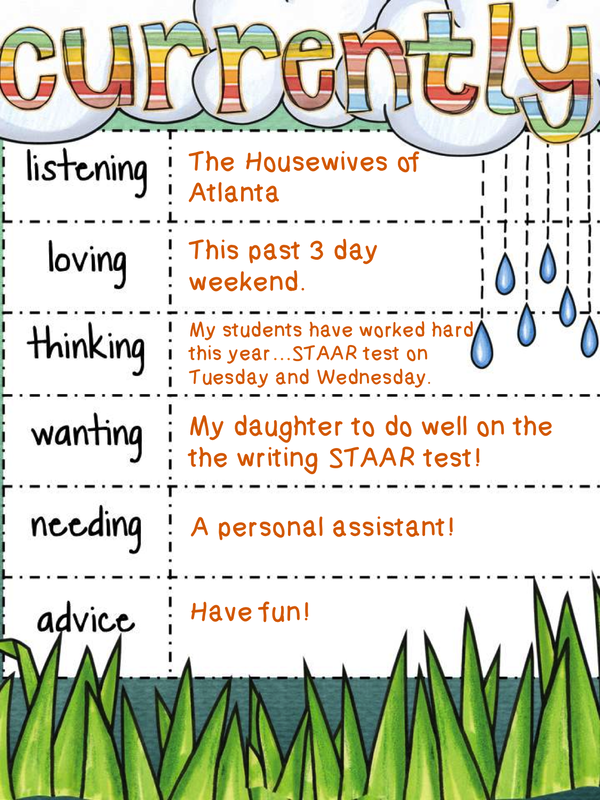 A personal assistant!?!?! Sign me up for one of those, too! Best of luck with your STARR testing for you and your daughter! I just know everyone's hard work will shine through! Thanks for sharing! I found you on the April Currently! I just finished watching Real Housewives of Atlanta and I cannot WAIT for the reunion!!! I am SO excited to find you and to be a new follower. Don't you just love how that happens through Farley's Currently? Congrats on being in the top 50, BTW!